Jane Blundell Artist: Zorn Palette exploration. I remember coming across a reference to the Zorn palette some time ago. I looked up what it was - a palette of just 4 colours used at times by Swedish artist Anders Zorn (1860 - 1920). It's an oil painting palette, but the gorgeous flesh tones many have created using this palette for figure and portrait work intrigued me. I made a note to test them out some time and finally did, using gouache. Zorn is said to have used ivory black, titanium white, cadmium red and yellow ochre. His paintings often have other colours as well, but it is this quartet that is named after him. I chose to use Schmincke Ivory black, Titanium white and Vermilion tone gouache, and Winsor & Newton Yellow ochre. Not identical but similar. Using the Neutral Grey rather than black, I mixed up a range of colours with the yellow ochre and vermilion tone. Lots of interesting flesh tones. I then wanted to see whether I could actually get some greens with this mix, so I made a colour wheel with the yellow, red and grey. Purples wouldn't be possible but very neutralised greens were. I explored some random mixes using these three with white. Translating these colours into watercolour, I switched to DS Yellow Ochre, DS Cadmium Red Scarlet (discontinued but I still have some) and my Jane's Grey to keep away from black. In watercolour the white of the paper is usually the white and adding water rather than adding white creates the tints, though with this palette I would probably add white watercolour if I were actually using it for flesh tones. It makes some interesting mixes and might be fun to paint with but since there is indanthrone blue in the gouache mixed grey and ultramarine in my mixed grey, I'd rather add a blue than a grey and be able to make an even greater range of colours. 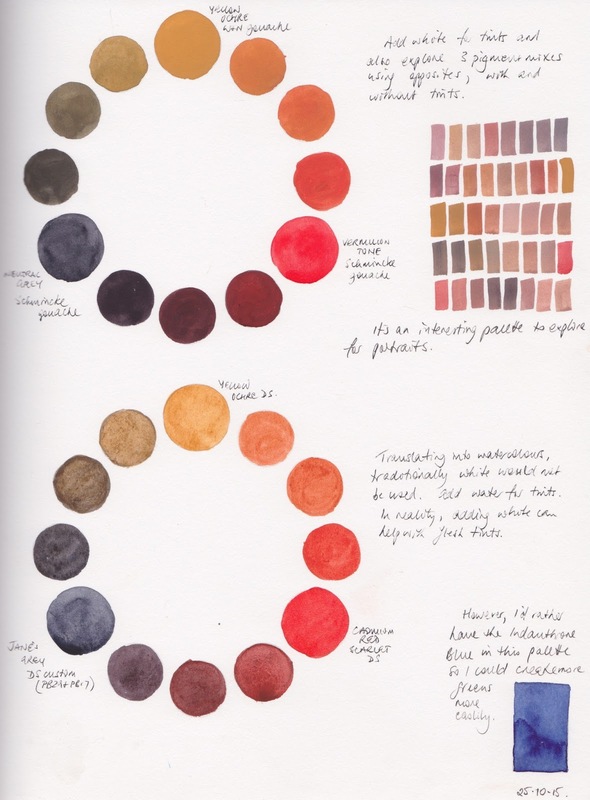 Fascinating - would love to see you paint with this palette! It needs to be the right subject - probably a portrait! Very interesting breakdown. I've always admired Zorn's paintings but wondered about his limited palette. I think I'd miss green! Thank you so much for laying it out so clearly! I know what you mean, but if the black tints to a blue-grey, some sort of green is possible. If only used for portraits and figures I guess a strong green isn't needed. You can do variations of the zorn palette, like ditching the black for ultramarine and the yellow ochre for a hansa yellow medium, a pyrol red and buff white; that way you're not stuck to just portraits but by swatching the ocher and the black you can use it for landscapes,botanicals and portraits,but because it is now more translucent it is more suitable for a watercolor zorn; you can chose any variaty of yellows of your liking for that matter,as long as the mixing values are the same you should have a similar result; i hate black so i use ultramarine and use my grey as my darkest value and so on. example; mix hansa yellow with ultramarine= green, add red; you get brown; add ultramarine and you get grey wich you can scale down to any variation of your liking by adding buff white or white gouache. I use gouache since i dont use ds paints. I got me, by accident, a really awesome zorn quingold @jane. Mix blue,red= purple. Add yellow mix brown. Add more yellow mix = light brown; add a hint of red and voila. I am getting overhelmed fast so i always use a limited palette. I can have a 36 color palette but to use them all in one piece i would get an adhd flatline,lol. I like having options. But per painting i use a max of 6 colors. For skintones zorn works awesome,but my travelpalette needs 6 more as i like bright. mute is not my cup of tea; but even with my favorite set,the sennelier paints,zorn works awesome. Zorn was dead before they invented titanium white. 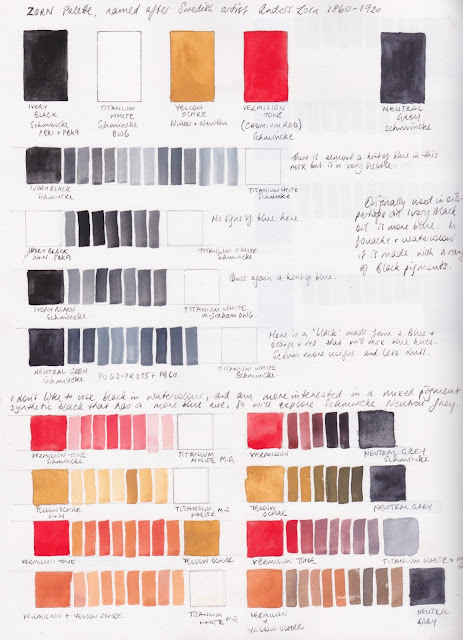 Adding more watercolour swatches to my website.